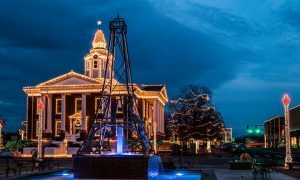 The Arkansas Trail of Holiday Lights returns for its 23rd year with a statewide celebration of the holiday season featuring parades, lighting ceremonies, open houses, Santa visits, concerts, live nativities, illuminated displays and more. To check out events in your area – and all across the state! – visit www.Arkansas.com/TrailofHolidayLights. For more holiday trip planning ideas, go to this month’s edition of “Discover Arkansas” at www.arkansas.com/discover-arkansas. And don’t forget to share your own holiday photos with us on Facebook (Arkansas State Tourism) or Instagram (@Arkansas) using #ArkansasTrailofHolidayLights. Now is the perfect time to start planning your own holiday light adventure. Go to www.Arkansas.com/TrailofHolidayLights to get started!